OK, I’ve been hearing about this board game for a while now and, I have to admit, I have been very resistant to it! 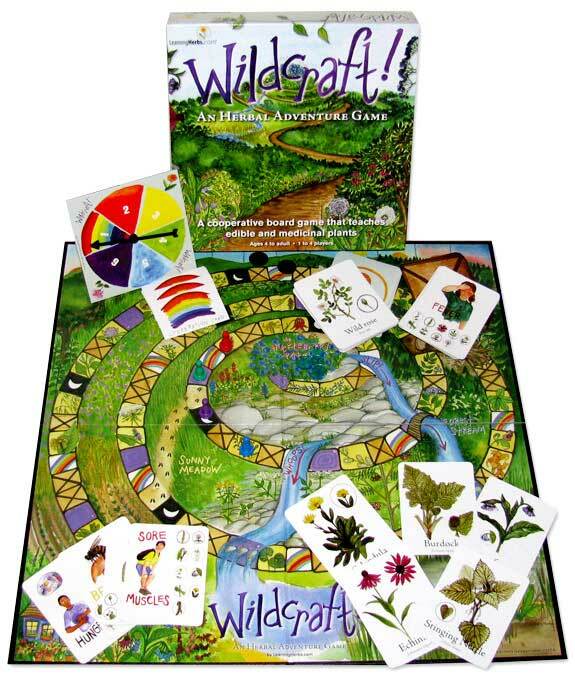 I’m not totally sure why, but I think it has to do with the feeling that if I’m a good herbalist, I shouldn’t need the aid of a board game to be able to teach my kids about herbs. (I know, that is stupid… if it’s fun, who cares, right.) Still, when the game went on sale (1/2 off!) last week, I decided to give it a try. I really didn’t think Kaia was going to go for it. It doesn’t have anything to do with mermaids, castles, or the like. But, when the mail was delivered and Kaia saw the game, she flipped out! She was so excited to play, that we had to schedule an emergency “family play night” that night! So, did I like it? I have to say, I am thoroughly impressed! It was SO flippin’ cute and fun! Kaia loved it and for once wasn’t all competitive about who won! (No one wins, it’s all about cooperation.) We all liked the story that went along with it… collecting herbs to help with our ailments…. picking huckleberries…. It is just fun! I even learned some new herbs! Grandma needs huckleberries to bake a pie. You and your cousins embark on an adventure up the mountain to collect berries as well as herbs she uses. Will you all harvest the right plants to help with the trouble you run into along the way? Will you make it back before nightfall? The only way to win is by helping each other out. It also teaches team work, for you will rely on each other’s knowledge of plants and good fortune to make it to the Huckleberry Patch and safely back to Grandma’s. Great idea. I know someone who would love it. Where did you find it half price? the giveaway is still going on at herbal roots! i draw a name tomorrow (friday 12/11) so there’s still a chance for someone to win one. i’m glad you like it! i think it’s a great load of fun. the cards make great flash cards too for road trips and such. i think it would be great fun to take them along on a nature hike and see how many herbs can be found that are in the deck. It looks fun, but I try not to play things I am destined to lose and lose BIG! I would be clueless. No, really, you wouldn’t lose… you don’t have to know your herbs at all! You learn them as you go from the cards you draw… you don’t have to know anything about herbs! Even my husband enjoyed it! karen, that’s the beauty of the game…you don’t have to know about herbs to play it, IT WILL TEACH YOU!! that game looks so cool! I might just have a to buy it just to play it with my nieces and nephews this christmas. We LOVE this game in our home, and have let friends borrow it from time to time, just to share the fun.